We are interested in exploring the use of designed oligonucleotide libraries made by massively parallel DNA synthesis to create novel genetic elements such as complete human peptide displays. Some of our projects are described below. We, together with our collaborators in Greg Hannon’s laboratory, have generated large libraries of shRNAs that cover the entire human and mouse genomes. The libraries are designed using shRNA prediction algorithms and synthesized in a massively parallel fashion using Agilent microarrays (171, 183).. Oligonucleotides are PCR amplified and cloned into retroviral or lentiviral vectors. At this point they can either be used directly or sequence verified and arrayed. 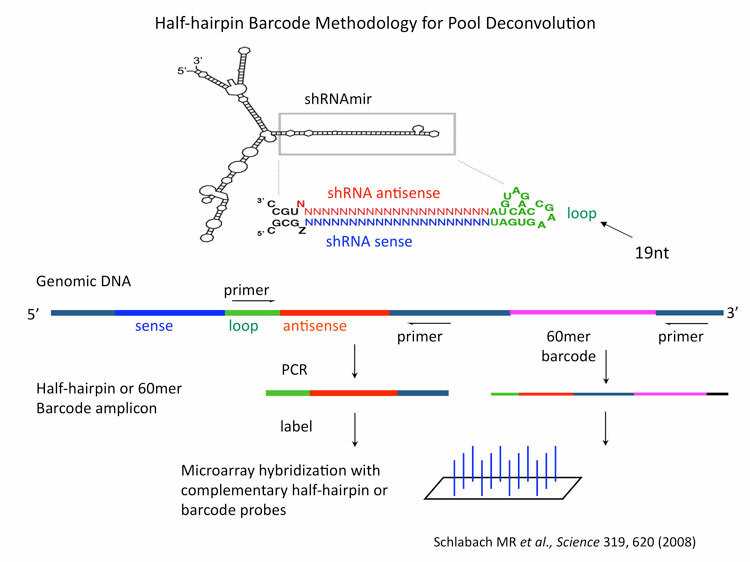 Each vector also has a unique barcode associated with it for microarray deconvolution of pools. In this way we can generate large libraries of shRNAs for genetic screening. We have taken a synthetic biology approach to the generation and screening of transcription factor binding sites for activity in human cells. All possible 10mer DNA sequences were printed on microarrays as 100mers containing ten repeats of the same sequence in tandem, yielding an oligonucleotide library of 52,429 unique sequences. This library of potential enhancers was introduced into a retroviral vector and screened in multiple cell lines for the ability to activate GFP transcription from a minimal CMV promoter. Using this method we isolated 100 base pair synthetic enhancer elements that were as potent at activating transcription as the wild type CMV immediate early enhancer. The activity of the recovered elements was strongly dependent on the cell line in which they were recovered. None of the elements were capable of achieving the same levels of transcriptional enhancement across all tested cell lines as the CMV enhancer. A second screen, for enhancers capable of synergizing with the elements from the original screen, yielded compound enhancers that were capable of 2-fold greater enhancement activity than the CMV enhancer, with higher levels of activity than the original synthetic enhancer across multiple cell lines. 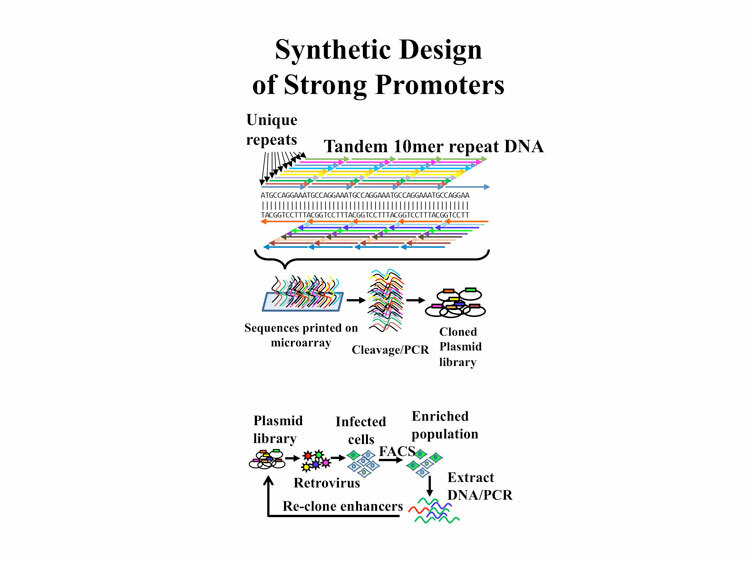 These findings suggest that the 10-mer synthetic enhancer space is sufficiently rich to allow the creation of synthetic promoters of all strengths in most cell types. The synthetic biology approaches described above could be applied to a wide variety of situations. For example, the current library could be used to search for transcription factors regulated in response to a particular stimulus by FACS sorting plus and minus stimulus looking for a shift in the expression levels, much like we have done for protein stability. One could also take different enhancers and combine them with a synthetic minimal promoters either designed de novo, or taken from the 20,000 known genes, this entire complement could be used to look for optimization or for pairing between particular enhancers and minimal promoters. Synthetic repeat libraries could be placed in 5’ UTRs to look for sequences capable of enhancing translation or even acting as IRES elements. Such libraries placed in 3’ UTRs could also be designed to act as microRNA targets to provide or to look for novel elements that confer stability, instability or splicing regulation on a transcript through recruitment of RNA binding proteins. DNA barcodes linked to genetic features greatly facilitate screening these features in pooled formats using microarray hybridization, and new tools are needed to design large sets of barcodes to allow construction of large barcoded mammalian libraries such as shRNA libraries. We developed a framework for designing large sets of orthogonal barcode probes and demonstrate the utility of this framework by designing 240,000 barcode probes and testing their performance by hybridization (223). From the test hybridizations, we also discovered new probe design rules that significantly reduce cross-hybridization after their introduction into the framework of the algorithm. These rules should improve the performance of DNA microarray probe designs for many applications.